Roll up, roll up!! The third round of our blitz competition takes place this Monday 6th February in the hallowed surroundings of Lytton Hall. Starting at 7.30pm, entry is FREE if you’ve entered either of the previous rounds, else it’s only £1 to enter (and we’ll treat you to a cuppa & some biscuits!). Casual players are very welcome – you don’t have to be a member to take part. We’ve seen a total of 31 players in the tournament so far, 7 of whom were drop-in players. Over 20 people showed up for the last round and it would be great to see another strong turnout! Come along and enjoy a night of chess that is raw, maddening and inspirational – but never dull! Author HammerPosted on February 2, 2017 Categories Club Updates, General ChessLeave a comment on Blitz Tourney… Round 3! An East End Bust Up! Drama, failure, joy, misery and dogged determination in the face of adversity all played their part in the evening’s entertainment. A perfect mirror of Hammer 1’s journey through the division this season. The drama was provided by Bajrush, our own WOSF, who had an unbelievably complicated game – what’s new? He confessed afterwards that he was lost at several points, but he kept piling oil on the fire and posing new problems. In the end his opponent cracked and our first win was in the bag. Our other wins came from Matteo and Safi. Matteo’s was a case of good old cockney determination. In a seemingly equal position Matteo kept probing, manoeuvring, repositioning pieces and squeezing his opponent. He created a Harry passed pawn and was able to deflect his opponents King whilst his King penetrated the Queenside. The win was secured. This was a welcome return to form for Matteo and should be celebrate along with his first ECF grading of 155! Safi’s win was the joyous moment of the evening – he displayed great skill to win from an equal position and earn his first victory of the season in London 3. A great performance. Draws were secured by John Woolley, Jeremy and Josue. To be honest we should have won all three games although Jeremy confessed that he was lost in at least three points of the game. 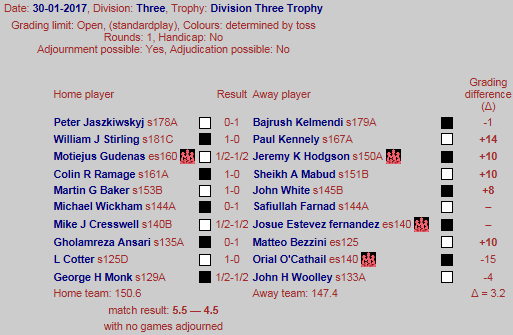 John’s game was agreed a draw in a static pawn structure with same-coloured Bishops. Crucially he was a pawn up and I believed he was winning. However, a draw was agreed. Josue had a won game but fell for a tactic that resulted in perpetual check. In his second game for Hammer he dominated and was cruising to victory. Unfortunately his opponent had other ideas. C’est la vie! Jeremy’s game was another amazing encounter. In the end he had King and Queen against King and Knight – no other pieces on the board. Unfortunately time was short and he could not force the win. This is (another) one for future training sessions! I suffered an appalling loss with complete memory failure – I went wrong at the first move, playing a variation I knew nothing about and am at a total loss to explain why. Definitely early signs of senility. Orial had a dead certain draw, if not a good shot at a win. One mistake and he was totally on the back foot, even though with opposite-coloured Bishops he still had good chances of a draw. Again, it was not meant to be. Paul had a tough game against a very awkward opponent. It was a difficult game, and not just on the board. Unfortunately, he had to allow a passed pawn, and with a bad Knight against a good Bishop he was always going to struggle. The toughest loss was probably Sheikh’s – he was totally winning. The intensity of this game – a King’s Gambit – affected both players, with errors on both sides. Indeed at one stage Sheikh castled through check – neither he nor his opponent picked it up. Later in the game Sheikh missed the fact he was in check and played an illegal move. This was spotted and he incurred a 2-minute penalty. This definitely threw Sheikh and he was rattled. So, despite being a piece up he contrived to lose very quickly. This was a tough loss and his play deserved so much more. As I have said before, Caissa can be very cruel. A 5.5 – 4.5 loss was the score on the night. A tough loss and we will have to improve to survive in London 3. Come on Hammer, the fight for survival is truly on!! Keep the faith!!! Author HammerPosted on February 1, 2017 February 2, 2017 Categories Club Updates, Games2 Comments on An East End Bust Up!